At its October 2012 meeting, the then BPA hosted a mini-forum which involved five of the candidates standing for election to the South Ward of the Ballarat City Council. Those who attended were Peter Innes, Matt Mattson, Joshua Morris, Jim Rinaldi and Sundram Sivamalai. Each of the candidates was given the opportunity of addressing the meeting on local issues of interest to them and then participated in a general session of questions and comments. It was pointed out to the candidates that the BPA had enjoyed an excellent relationship with retiring Councillor Ben Taylor and the hope was expressed that a future South Ward Councillor would continue the close liaison. Some fifteen months after their planting in October 2012, the Buninyong street vines are beginning to take shape. 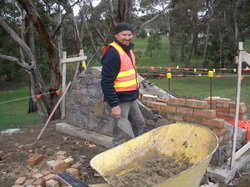 This project was initiated in early 2012 by the Association with the great cooperation of the City of Ballarat. The vines, especially those on the southern side of Learmonth St, are now well-established and are giving some idea of how the streetscape will look after a few more years. Local residents entering Buninyong from Mt Helen, recently will have seen the start of works to install four new entrance signs to Buninyong. The entrance signs will be of stone and sawn bluestone with brushed bronze lettering, and will be highlighted by an image of Mt Buninyong. The design work for the project was carried out by local resident David Turley, of DHT Consulting. The $34,000 project will also have solar lighting installed to provide night visibility to travellers entering Buninyong. 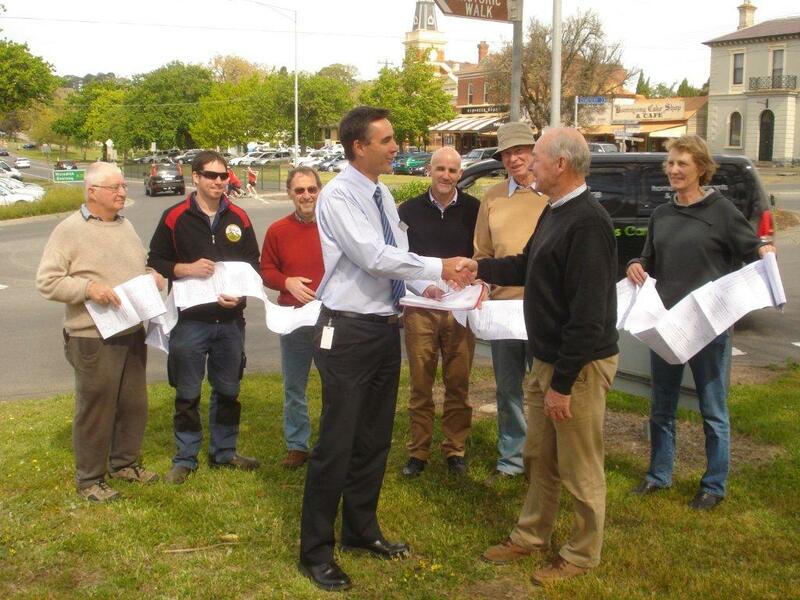 This project has been undertaken by the Buninyong & District Community Association as part of its Program to improve the village streetscape and to enhance its tourism potential. The project team consists of BDCA Executive members Barry Fitzgerald and Ian Salathiel, and local landscape designer/architect David Turley. The City of Ballarat was represented by its Coordinator of City Image, architect Tim Grace. Barry Fitzgerald said that while working on roadside reserves carried with it many regulations and requirements, the project had been given every assistance from VicRoads and from the City of Ballarat. installation of flashing lights at the School Crossing on the Midland Highway at Cornish Street. Co-ordinated by the Committee’s Convenor, Lyn Lea, the petition was handed to VicRoad’s Regional Manager Ewen Nevett, by BPA President Ian Salathiel and a group of members at the roundabout corner on 23 October 2012. The petition was sparked, in part, by a near-miss accident involving a B- Double truck which skidded for about 150 m before crashing through the roundabout on 9 March 2012.
future. The draft report is currently being considered by Council and VicRoads. orange-jacketed employees posted at the Learmonth Street/Warrenheip Street intersection also noting traffic flows. so-called Western Link Road which is planned to feed onto the Midland Highway at Magpie. present study, VicRoads is well aware of the need to consider this issue in its future traffic planning. to the need for flashing lights at the Children’s Crossing on the Buninyong hill. The full text of the speech made by Mr Howard on local traffic issues can be acccessed on his website.